Summer bedding plants dont all have to be petunias and marigolds! As well as the more common bedding plants there are a huge range of annual bedding plants you can grow for height, scent and colour, from cornflowers and sweet peas to Rudbeckia and zinnias. Some, such as petunias and geraniums (Pelargoniums) are frost-tender perennials, which are treated as annuals and require frost protection; others are hardy annuals which can be sown directly outside. Nearly all summer bedding plants can be raised from seed although there is often a lot of work involved, from germination to pricking out tiny seedlings. If you dont have the time or space for raising fiddly seedlings why not try our bedding plug plants to quickly get your garden started! It's easy to order bedding plants online. Weve listed our 10 best summer bedding plants below. 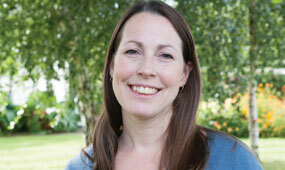 Learn more about growing bedding plants with our 'How to grow bedding plants' guide. For more information about autumn bedding plants for winter and spring flowering, take a look at our 'Top 10 winter bedding plants' guide. You can choose from our large range of bedding plants for sale here. One of the most versatile summer bedding plants, Begonias are well loved for their large flamboyant blooms in a wide range of colours, and their ability to thrive in both sun and shade. 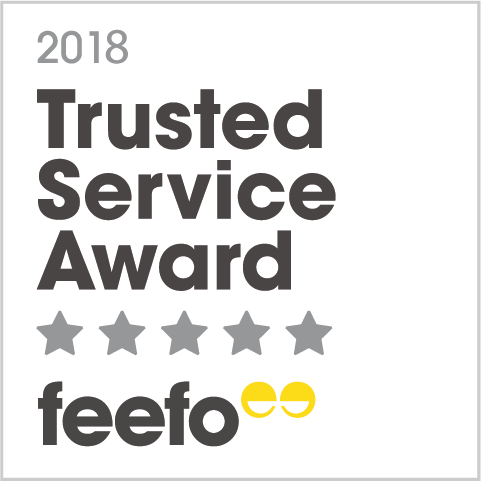 Flowering continuously throughout summer up to the first frosts, Begonia bedding plants can be upright or trailing and are suitable for beds, borders, hanging baskets and window boxes. Some varieties such as Begonia 'Non-stop Mocca' even have dark leaves to add foliage interest to bedding schemes. 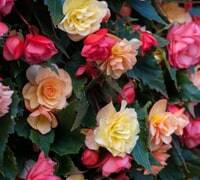 Tuberous Begonias can be lifted and stored over winter and get bigger and better each year whereas Begonia semperflorens cultivars such as Begonia 'Lotto Mixed' are treated as annual bedding plants. 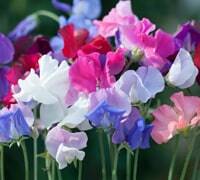 Sweet peas make fantastic cottage garden bedding plants. Let them scramble up obelisks, wigwams or netting where they will reach heights of 1.8m (6') or alternatively try dwarf sweet peas for groundcover at the front of beds and borders. With their delightful fragrance and wide range of colours, sweet peas are excellent summer bedding plants and also provide bunches of gorgeous fragrant cut flowers throughout summer! 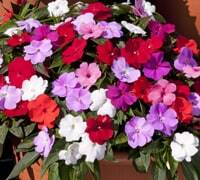 Incredibly valuable for shadier beds and borders, Impatiens summer bedding plants produce large flowers in a range of fruity colours, from pinks to reds through purples and white. New Guinea Impatiens have replaced the previously popular Impatiens walleriana due to Busy Lizzie downy mildew, but share the same desirable characteristics  a long flowering period, bushy mounding habit and a preference for partial shade. Forming big spreading plants, Busy Lizzies are superb for ground cover in beds and borders or will quickly fill patio containers with colour up to the first frosts. A common bedding plant and for good reason! These sturdy, sun-loving plants are well suited to hot, dry conditions and flower all summer through to the first frosts. 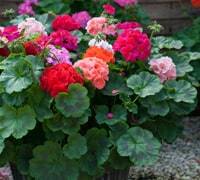 Pelargoniums, commonly known as Geraniums, are versatile bedding plants for summer and include trailing, climbing and upright varieties which are perfect for beds, borders, patio containers, hanging baskets and obelisks. Primarily available in vibrant shades of pink, white and red, geranium bedding plants are also available in subtle shades of lilac, apricot and rich burgundy. Much loved for their architectural flower spikes and incredibly long flowering period, Antirrhinums have fascinating mouth-like flowers which open when squeezed, making them a particular favourite with children. Available in a wide range of strong and vibrant colours, snapdragon bedding plants vary in height, from dwarf plants no taller than 25cm (10") to large plants such as Antirrhinum 'Royal Bride' which reach 90cm (35"). 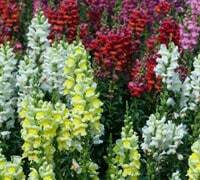 Tall snapdragons make superb cut flowers and add height to beds and borders; dwarf snapdragons can be used in beds, borders and patio containers. If youre looking for bedding plants that attract bees, Antirrhinums are a good nectar source, being most popular with bumble bees. 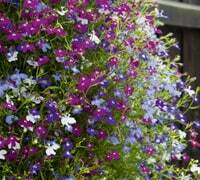 The dainty flowers of lobelia create wonderful dense waterfalls of colour in hanging baskets and containers, or grow the upright varieties for edging beds and borders. Easy to grow and long-flowering, they compliment any summer bedding scheme and look particularly pretty mingling with bedding plants in hanging baskets. Lobelia generally come in shades of cool blue, purple and white and are great if youre looking for blue annual bedding plants. Surely the summer bedding plant with the most exciting blooms! 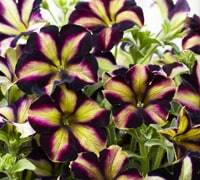 Petunias are popular for their large trumpet flowers in a fantastic array of bright colours and patterns, including stripes and picotees. 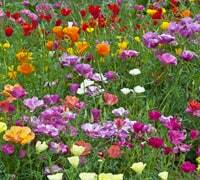 These vigorous half-hardy annuals can be trailing or upright, and look spectacular spilling from hanging baskets, window boxes and containers, or massed in beds and borders. Some such as Petunia 'Purple Tower' can even be trained to climb a frame! Petunias are particularly useful if youre looking for purple bedding plants, offering shades of mauve, lilac-blue or rich deep purple. 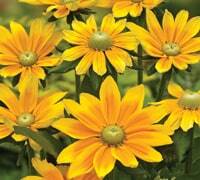 Annual rudbeckias, also known as coneflowers, make robust and cheerful garden bedding plants. Particularly useful as late summer bedding plants, rudbeckias flower from July through to October and add a fiery element to annual displays with their red, orange and yellow colour palette. Compact varieties such as Rudbeckia 'Toto' are excellent in beds and patio containers; tall varieties such as Rudbeckia 'Cherry Brandy' work well planted in sweeping drifts in beds and borders or dotted between perennials and shrubs. Not only do they look fabulous in the garden, rudbeckias also make excellent, long-lasting cut flowers for a vase indoors. For vibrant colour you cant beat a Californian Poppy! This hardy annual is sown directly in beds and borders and will happily self-seed, creating effortless drifts of colour year after year. Traditionally orange, recent breeding has brought us a plethora of new colours including yellows, pinks, reds and apricot. The intensely coloured silky blooms are borne above neat clumps of feathery blue-green foliage and are attractive to bees and hoverflies. Thriving in poor, dry soils in full sun, simply scatter the seeds of these lively summer bedding plants where you want them to flower and let them take care of themselves. If you want bedding plants that attract bees look no further than cosmos! The large saucer-shaped flowers bob prettily on slender, wiry stems and are a great source of late nectar for pollinating insects. The wispy fern-like foliage adds texture to bedding schemes and works well in an informal cottage-style bed or border. These fabulous summer bedding plants are mainly available in shades of pink, red and white, although Cosmos sulphureus provides fiery yellows, oranges and reds. 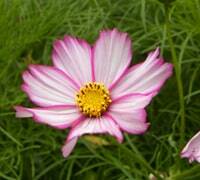 Cosmos bedding plants begin blooming in mid-summer and flower prolifically until mid-autumn. They also make fantastic cut flowers for a vase indoors.